After visiting her family in Afghanistan for the first time, the singer-songwriter is pouring her experience into her solo project, Ruby Mountain. Krystle Ahmadyar's pop project, Ruby Mountain, draws from Afghan folk songs and noise music. 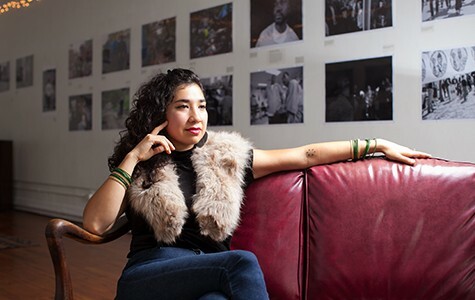 Vanessa Camarena-Arredondo of Studio Grand, an activist-centric venue in Oakland, approached local singer and multi-instrumentalist Krystle Ahmadyar to do an artist residency at a time when the musician was dealing with a flurry of mixed emotions. Ahmadyar, who is known for her soulful, vocal-driven solo project, Ruby Mountain, had just returned from visiting Afghanistan for the first time with her father, who hadn't been back to his native country for more than forty years. She spent weeks accompanying him on emotional reunions with relatives and childhood friends, and met many family members whom she had previously only seen in photos. But what made the trip bittersweet was that, for the first time, Ahmadyar personally witnessed the difficulties of life in her family's homeland. Ahmadyar was born in Oakland. When she was ten years old, she moved to Omaha, Nebraska, where she grew up among an Afghan-American community. She credits her father, who is a singer and harmonium player, for introducing her to music at a young age and passing down cultural traditions through folklore, song, and dance. During her trip to Afghanistan, Ahmadyar found herself grappling with the realities of life in a war-torn society, which seemed a world away from her father's recollections of his youth. "The Afghanistan I grew up hearing about was like, 'During full moons, we'd go out and have a picnic in the mountains and everyone would sing and stay up really late,'" she recalled in an interview. "So there's this sense of safety and connection to the land." When she arrived, however, the differences she witnessed between public and private life in Kabul struck her. While she felt like she could be herself in relatives' homes, she recalled seeing almost no other women in public places, and her presence attracted curious glances from strangers. Family members warned her not to stay out late for fear of getting kidnapped, and she worried that being a foreigner would give her trouble at military checkpoints. "When we went to visit, [Afghanistan was] completely changed. The stories I heard no longer can happen, and my father was devastated to see it," she said. Ahmadyar's father had immigrated to the United States before the 1978 Saur Revolution, and had been absent during years of civil war, the Soviet invasion, Taliban rule, and the War on Terror and its aftermath. "A lot of the time [Kabul] felt like a prison within a city," she continued, "because there were so many tall walls and barbed wire covering up all the buildings that he used to know." However, the visit provided many joyous occasions, as well. Surrounded by extended family, Ahmadyar spent much of her journey singing folksongs, listening to elders' stories, and taking field recordings of conversations and nature sounds. Upon returning from her trip, which she described as simultaneously "heartbreaking and beautiful," the musician yearned to pour her experiences into song. 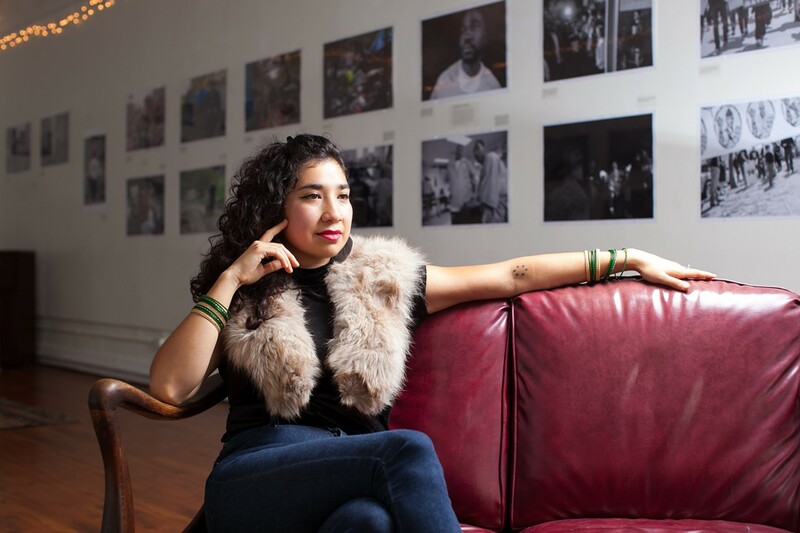 The opportunity of a residency at Studio Grand prompted her to take her Ruby Mountain project in a new direction, combining pop song structures with elements of experimental, electronic production, traditional Afghan music, and multimedia inspired by the impactful visit. The residency, which began in August and ends in December, gives her access to Studio Grand's space for rehearsals and requires her to throw one show per month. This has given Ahmadyar an impetus to explore the connections between the various sonic and conceptual threads in her different music projects. (In addition to Ruby Mountain, she performs Afghan folk music with her father and fronts the down-tempo rock band Los Sirenas.) Part of her goal for the residency, she said, is to impart pieces of her Afghan culture to her listeners in novel ways. And on a personal level, the residency has served as an opportunity for her to process her reactions to the strife she saw in Afghanistan and her appreciation for the richness of her heritage. Ahmadyar started writing songs shortly after graduating from Mills College in 2008, where she studied under Maggi Payne, a prominent figure in the local electronic music community. While Ahmadyar grew up playing Afghan folk music that utilizes instruments such as the harmonium and tabla, at Mills, she created avant-garde sound collages that incorporated field recordings, singing, and electronic noise. When she began performing as Ruby Mountain around 2011, Ahmadyar gravitated away from both Afghan folk music and experimental electronic music toward a stripped-down pop sound. Ruby Mountain's current song catalogue prominently features her textured, throaty singing over subtle ukulele or guitar melodies and, occasionally, understated beats. On her recent single, "Into You," for instance, Ahmadyar explores the edges of her raspy timbre as she gently strums an acoustic guitar. On the track "Oak Tree," her voice resonates over the gentle taps of a drum machine. For her upcoming show at Studio Grand on October 28, Ahmadyar will play a Ruby Mountain set that will incorporate elements of field recordings and folk songs from Afghanistan, as well as new, electronic elements that hark back to her early days of making noise music. The show will feature collaborations with electronic musician Puzzle and visual artist David Chacon, who helped Ahmadyar transform her photos from Afghanistan into hypnotic visual projections that will accompany the music. Though in the past, Ahmadyar has separated herself as an Afghan folk singer, a pop artist, and an experimental musician, she is working toward integrating these facets of her creative output in her forthcoming releases as Ruby Mountain. "Ruby Mountain is a project where I get to be real about what's happening to me and what's happening in the community. ... The project really comes from my experience of being taught about storytelling from Afghan people," she said. "I have a rich history of people in my family being writers, poets, storytellers, and singers, and they've all used it to speak their truths." The tools she was searching for, it appears, have been with her all along.